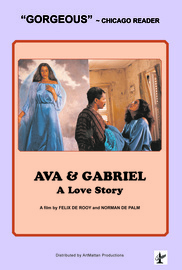 The story takes place on the island of Curacao in the late Forties.Upon request of Father Fidelius, parish priest of St. Anna's, the Surinam painter Gabriel Goedbloed arrives from Holland to paint a mural of the Virgin Mary in St. Anna's Church. The drama unfolds from different angles. First the clergy and locals are confused by the fact that the painter is black, originating from Surinam, but resettled in The Hague, where he received a Fine Art education. The close knit Antillian society did not welcome strangers who would not conform to their colonial way of life in those days. Contributing factors arise when he chooses a young teacher, Miss Ava Recordina, who is from mixed origin, to be his model for the painting of the Virgin Mary. Ava is engaged to the white police major Carlos Zarius who is not too happy with his fiancé posing for the painter. The fact that the Dutch Governor's wife, Louise van Hansschot, is interested in Gabriel also fuels the tension. In the end, Gabriel Goedbloed falls victim to the controversies, hypocrisies and intrigues that have arisen around his person and his paintings.